A young prison officer who attempted to smuggle a knife, drugs worth thousands in jail wings and mobile phones for inmates at HMP Peterborough has been locked up for more than three years. Ibrahim Hussain (20) had only been working at the jail for a year when he tried to bring in the package filled with illicit goods. But Hussain, of Burmer Road, Peterborough, was caught when random searches were carried out. 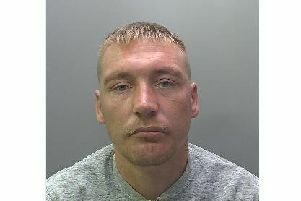 Today (Thursday) he was jailed for three years and four months after pleading guilty to trying to carry out the plan. As he is under 21, his sentence will start in a Young Offenders Institution. The court was told Hussain had started working at the privately run jail in 2016 - but was caught bringing the package in on October 26 last year. The parcel - which Judge Farrell said had been packaged ‘very professionally to avoid detection’ - contained the knife, which had a three inch blade, three mobile phones and charging leads, and a quantity of cannabis. The court was told the drugs had a street value of around £800 - but in prison they would have a value of £4,000 to £8,000. Miss Saimbhi added that Hussain was ‘born and bred’ in Peterborough, and that made him vulnerable to threats. She said: “He is known locally. Peterborough prison might not have been the best place for him to be working. People knew who he was, who is family was, and where he lived. The court was also told Hussain had said he would be paid £400 for the job, which he later denied - but Judge Farrell said Hussain had debts, and there was a financial element to the crime. Miss Saimbhi urged Judge Farrell to impose a suspended sentence - but he said only a severe custodial sentence was appropriate. He said: “It is not only a gross breach of trust, but it strikes at the very root of your role as a prison officer. “You have betrayed your fellow officers and you have betrayed your own moral code of conduct. You were making available in prison drugs, a weapon and means of communication. You know from being a prison officer the disorder and violence caused by the availability of drugs in prison, and also the potential of harm and risk of threats to people outside of prison through the use of mobile phones. There were tears in a packed public gallery as Hussain - who turned up to court in a suit and tie - was taken away to start the sentence. Hussain had pleaded guilty to two counts of conveying a list A article into prison - relating to the knife and the drugs - and was given a sentence of three years and four months for each. He also pleaded guilty to conveying a list B article in prison, in relation to the phones, and was given a 12 months sentence. All the sentences will be served concurrently, meaning a total sentence of three years and four months. He had pleaded guilty to bringing a restricted document out of prison. The court heard there was no security risk relating to the document, and Judge Farrell imposed no separate penalty.